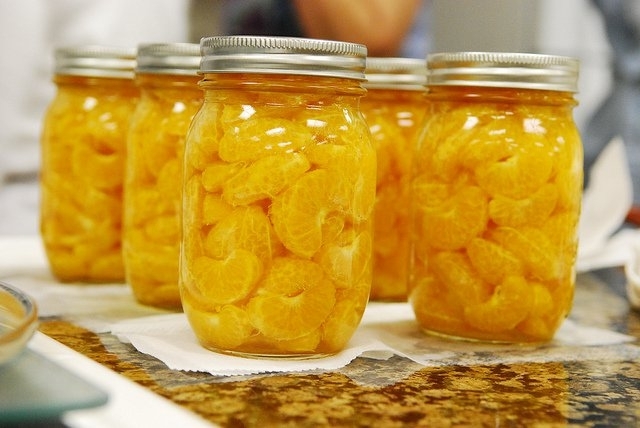 Home preserved foods: Nutrition friend or foe? "Splenda is the only sugar substitute that can be added to covering liquids before canning fruits. Other sugar substitutes can be added when serving." Also, you write that gelatin-thickened products must be refrigerated and used in a month or so. Is this because the gelatin loses its strength or for another reason? I'd imagine there are many other hydrocolloids that could be substituted for gelatin and could be kept for long periods of time? Thank you, Kevin, for your interest in this blog post! To answer your question about Splenda (or sucralose), it is the only sugar substitute that can be added to covering liquids before canning because other sugar substitutes are not all heat-stable. They may lose their sweetness through the cooking process, or they may develop off-flavors. The USDA does not recommend water-bath processing products made with gelatin for long-term storage. They should be refrigerated and used within 4 weeks for safety and stability concerns.